Grande Reserve brings together Chimay’s renowned Trappist cheese with the jewel of the Chimay Trappist brewery, Blue Cap Beer. 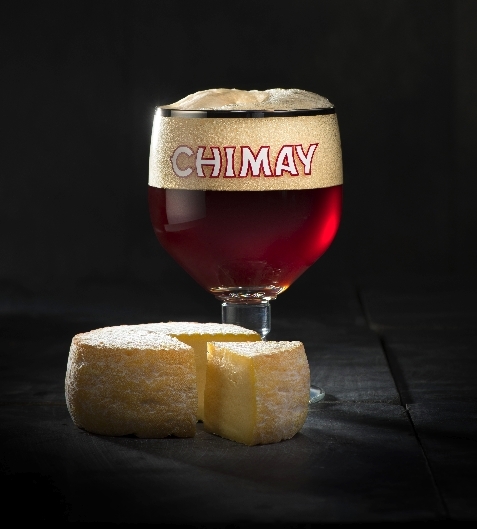 Chimay, named for the Belgium municipality where the famous Scourmont Abbey is located, is one of only three Trappist cheesemakers in the entire world. To qualify as Trappist, three rules must be followed: 1) the cheese must be exclusively made within the Abbey walls. 2) The monks must oversee the full cheesemaking process. 3) All profits must be reinvested in the Abbey’s foundation that provides funding for community projects. The Scourmont Abbey’s Cistercian monks start with pure, local, antibiotic-free milk, and follow time-honored monastic traditions to create their sweet, slightly tangy, semi-soft cheese. Grande Reserve is matured in the famous vaulted cellars of the ancient Abbey where the wheels are washed no less than four times with Chimay Blue Cap beer. The complex, strong taste of this favorite dark beer perfectly offsets the bitter notes in the cheese. The beer’s fresh yeasty, malty, rosaceous aroma adds even more personality to an exceptional eating experience. Chimay Grande Reserve is a beautifully balanced combination of creamy smoothness and robust, yet delicately refined character. Application: Fruity and intense, Grande Reserve is a distinctive addition to any cheeseboard and makes a great flambé. Substitute Chimay Grande Reserve for other cheeses to improve a breadth of both hot and cold recipes, especially the classic sandwich: grilled ham and cheese. Pairing: Grande Reserve pairs beautifully with any Chimay beer, but a cold Chimay Blue Cap would be the ideal choice. Il Forteto is 1,500 beautiful acres nestled in the lush Mugello hills northeast of Florence. This uniquely conceived farm cooperative pays tribute to the Tuscan way of life in the most delicious ways imaginable. Chestnuts have great historical significance in Italy. Il Forteto’s premium Castagno (Chestnut) Honey is collected from local bees that feast on organically grown trees in Mugello’s stunning groves. Dark and rich in color, Il Forteto Castangno Honey is smooth, creamy and semi-sweet with sensuous, earthy chestnut undertones. Il Forteto Castango Honey’s pleasantly bitter charm is delightful when combined with savory food. It is perfect drizzled over Gorgonzola melted on toast or as a glaze for sautéed chicken breasts or baked acorn squash. But it is also wonderful for sweet applications and is used in many authentic Italian pastries.